$10,000 will be awarded to one Mohave Community College graduating student each year. This is a one of a kind award, no other college offers this no strings attached cash award for a graduate. The money may be used as the recipient wants, preferably to pay off student loans or continue their education. 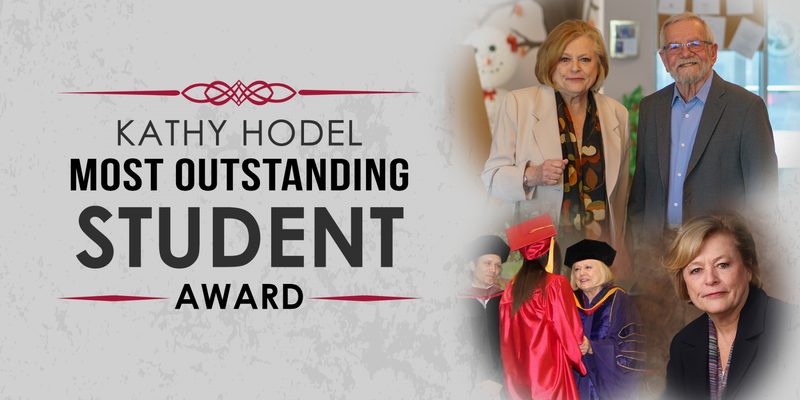 This incredible award is established through an endowment gift provided by Dr. James H. Childe to honor the memory of his friend Kathy Hodel. She passed away in 2018, after a long battle with bone cancer. Dr. Childe, a retired attorney and MCC instructor, gave nearly a quarter million dollars to establish this endowment. He chose to use this gift as a way to honor outstanding graduating MCC students and Kathy for her countless hours and efforts working to help MCC and our local communities. Kathy requested everyone remember the importance of service before self, and do what you can to help worthy causes in your own community.